The first part of this statement seems to refer to the rise in CO2 concentration in the atmosphere from 280 to 385 parts per million (100 ppm = 1 part in 10,000). But there is no evidence whatsover that outgassing from a single volcano, even a primordial super-volcano, has ever achieved such a massive output of CO2 in a day. If Plimer can not provide a reasonable bona fide reference or source for this statement, ABC must afix a correction advising that the statement is utterly without foundation. Moreover, the final row shows near identical trends for 1976-2009 as for 1976-1998, contradicting Plimer’s claim of cooling in recent years. This is not to suggest that there are no other errors. Indeed, the entire piece contains not a single sentence free of error or misleading information. But, at the very least, I trust you will append the appropriate official corrections to Plimer’s opinion piece as soon as possible. And ABC should consider apologizing for publishing such a clearly biased and misleading commentary. The higher trends in the period 1976-1998 are obvious, especially in NOAA and NASA series. As well, the near identical trends for 1976-2009 (shown as dashed lines) can also be seen. To ABC’s credit, they do appear to have a complete and clear complaints process. However, even though the facts would appear to support an unavoidable finding in favour of this complaint, the available statistics suggest an uphill battle. In 2008, a scant 3% of all complaints were upheld (487 out of 16,601 submitted). Of course, Plimer’s piece comes at a time of great political sensitivity in Australia, as the Australian Senate has just voted down the Rudd government’s climate change bill aiming to regulate greenhouse gases. It also coincides with Plimer’s pointed refusal to answer basic questions about his various claims and their sources, as he ducks and weaves in his ongoing shadow boxing match with George Monbiot. Plimer’s latest travesty should also be seen in the context of a concerted public relations campaign by the Australian Climate Science Coalition, and its parent organization, the Australian Environment Foundation, a campaign that is politically motivated and clearly aimed at derailing greenhouse gas regulation in Australia. I’ll be returning to the subject of these organizations and their recent actions soon. Meanwhile, it is noteworthy that the ABC opinion piece is Plimer’s first for the broadcaster’s “Unleashed” series. After this disgraceful performance, I trust it will also be his last. This entry was posted in Climate change "skeptics", Climate science disinformation and tagged Australian Broadcasting Corporation, Australian Climate Science Coalition, Australian Environment Foundation, Ian Plimer. Bookmark the permalink. I have also e-mailed them with a request to write up a formal rebuttal piece, but I’m not really familiar with the process and am not anticipating a favorable reply. [DC: I would not be surprised to see a rebuttal piece from one of the prominent Australian climate scientists. That’s the least ABC should do, and I’m fairly confident they will. if read grammatically, says that humans have added ‘just’ one part of CO2 for every 10,000 parts of CO2 in the atmosphere. This is worse than your (in my opinion overly-generous!) interpretation that he has slyly attempted to confuse CO2 with the total gas composition of the atmosphere. Nevertheless, whether you are correct, or whether the grammatical interpretation is, Plimer is being unprofessional. He is either playing cute with meanings, or he is an outright liar. I know where I would put my money. Hey guys, it’s only an opinion piece. No need to stress. That’s my opinion anyway. No need too get too detailed with it. [DC: It’s not just about “opinion”. It’s also about ethical standards in journalism. Why is ABC permitting the propagation of clearly false and misleading information? And why don’t they do some real reporting, by investigating the Australian organizations dedicated to perpetrating disinformation about climate change, with anonymous funding from fossil fuel companies and others opposed to regulation of greenhouse gases? Now that would certainly be a good start at “establishing the truth”. I’m willing to bet that behind the scenes the journalists at ABC are furious that some bone-headed manager with a hidden agenda has once again allowed anti-AGW propaganda to spew forth on ABC. At least the last time (the broadcast of the execrable Great Global Warming Swindle), the journalists got to fight back by subjecting filmmaker Martin Durkin to a scathing interrogation afterwards, where he was exposed as a reprehensible propagandist. And not a very skilled one at that. It is not just an opinion piece. Dr. Plimer is making claims that should be substantiated. Because he is identified by ABC as an academic, he is representing the academic community. What I wonder is whether anyone has complained to the head of the School of Civil, Environmental & Mining Engineering at the U. of Adelaide. My faculty encourages members to share our knowledge with the public through articles such as these, but if the dean of my faculty saw unsubstantiated stuff like this coming from any of the faculty members or grad students, he’d raise hell. [DC: You raise an interesting point. But sometimes professors are given remarkable latitude in that regard, especially if their fame exceeds that of the university they are employed by. It’s also clear that certain disciplines are more welcoming of contrarian views on climate science, even if unsupported by the facts. Plimer is far from the only contrarian geologist out there. It’s not the first time Unleashed have uncritically promoted Plimer and his book. But, no volcano did such, at any time within the past 250 years. So, Plimer is conceding that volcanoes have nothing to do with the current climate trend. Furthermore, he’s conceding that his volcanoes argument is completely irrelevant. Plimer has only irrelevancies to offer. If the science of AGW is sound what`s the fuss, Ian is only one scientist following a lost cause, isn`t he, or is he the bearer of truth. You guys are classic. Indignant, hurt and offended that ABC has given a sceptic some air time. Actually, watching ABC as our regular TV, as I do, it is evident that the corporation, and particularly Kerry O’Brien (7:30 Report) and Tony Jones (Lateline and Q&A) are very effective advocates for those who are concerned about AGW. You don’t often see the ABC draw atttention to the weaknesses in the work of Al Gore, Michael Mann, Stefan Rahmstorf, Eric Steig, Dr Phil Jones, James Hansen, Gavin Schmidt, James Annan et al. Further, they give Senator Penny Wong much more airtime than the counter view from Senator Steve Fielding. The ABC has played an important role in the framing of the debate in Australia, and in creating the current polarised political environment. I think you might find that they are giving Ian Plimer some time to fulfil their obligations to be “balanced”. I’ll bet that they are being criticised for being on “your” side. [DC: Obvious falsehoods, such as those propagated by Plimer, have no place in legitimate debate. But I am not opposed to Plimer having access to the airwaves, as long as he is properly challenged on his factual errors, as he was by Tony Jones on LateLine. (See “Ian Plimer, ABC and the lie that won’t go away”. So, where’s the middle chart, from 1940 to 1976? Too inconvenient to post? If 30 years of increasing CO2 can’t make the globe warmer, then CO2 has such an insignificant effect that it can be completely disregarded. That’s what the planet itself is clearly telling anyone who will listen. [DC: Regarding the “cooling” period 1940-1976, you raise a good point – but not in Plimer’s favour. The cooling was much less than claimed in Plimer’s bogus chart, which appeared to be from Martin Durkin’s error-filled film “The Great Global Warming Swindle. See Tim Lambert’s excellent post, “The Science is missing from Ian Plimer’s Heaven and Earth“. As for cherrypicking a year, or a particular month, or other bogus analysis to argue for the “disappearance” of global warming, I refer to you this post. 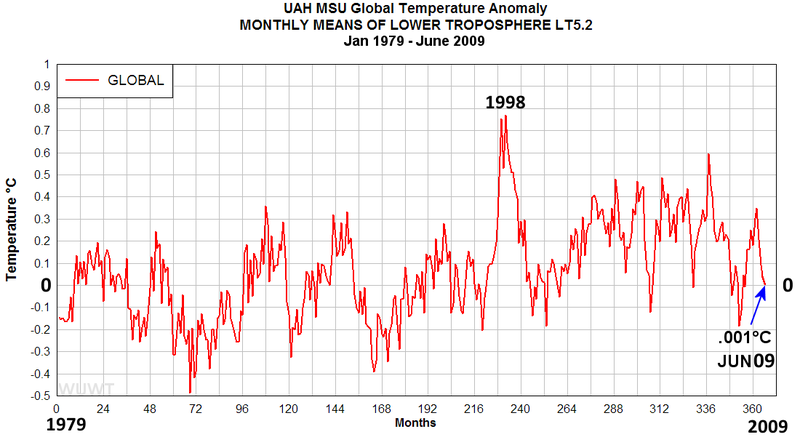 The UAH temperature record is clearly rising over the period 1979-2009, albeit a little slower than all the other temperature series. I don’t know, Pilmer may exaggerate a little, but compared to the lie that AGW proponents adhere to, i.e. that “the science is settled”, this is a storm in a teacup. [DC: “Exaggerate a little?” Come off it. Plimer’s the one who’s spreading falsehoods, as is perfectly clear to all but the most rabid anti-AGW believers. If we’re talking about the ABC having a “duty to correct any clear errors of fact, even in an opinion piece”, then why have they not mentioned anything about Chief AGW Alarmist, Al Gore’s movie, AIT being found by a British Judge to contain 9 errors? Yet the film is still worshipped as Gospel Truth by those of The Faith. [DC: AIT could use a couple of small clarifications or clarification, but that’s nothing beside the myriad whoppers in Plimer’s piece. The British judgment you refer to did have some mild criticism of the film, but found it essentially correct and faithful to the current state of scientific knowledge. That same judge likened anti-AGW proponents’ views to crackpot views such as lunar composition of “green cheese”. And I’m not even sure ABC broadcast AIT, but they did air Martin Durkin’s abysmal and error-filled Great Global Warming Swindle. Funny how rabid warmers like you only complain about journalistic ethics (an oxymoron?) when it’s your ox being gored. Gore, Mann, Jones, Stern, et. al. can tell all the whoppers they like with no objection from the likes of you, but any hint of hyperbole on the part of CO2 doubters and you are beside yourself with indignation. [DC: There are plenty of ethical journalists. For example, Tony Jones of ABC LateLine has done an admirable job of holding the contrarians to account, and exposing the deceptions of the likes of Plimer and Martin Durkin. Too bad ABC decided to do an end run and ran Plimer in a venue where he could go unchallenged.